Abhaya is translated from Sanskrit as fearlessness . The Abhaya Buddha is made with the open palm of the right hand extending outwards at the chest level or slightly higher. 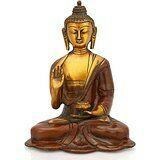 If you look at this Buddha hand gesture, or mudra, you will also feel the energy of protection, peace and a sense of strong, deep inner security. A powerful feng shui decor addition to any home. Abhaya Buddha is made of brass. Size : 6 Inches Height X 5 Inches wide X 3 Inches depth, Weight : 1.1 Kg, Material : Brass, Features:- Made from Quality Brass and Handmade in India. -------------- Pls beware from Copy product & ensure buying authentic product. This is exclusive product of Brand " Collectible India" and "covered by intellectual property rights laws". 'Collectible India' do not authorize any other Brand/Seller to sell it and won't be responsible if any copy or substandard product send by any other seller.